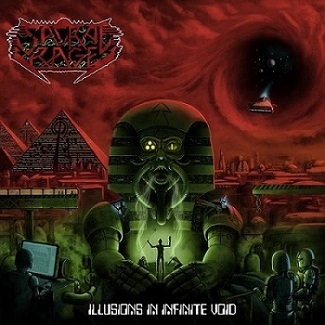 “Illusions in Infinite Void” is the debut full-length album from Greek heavy/speed metal band Sacral Rage. As far as debut albums go, you couldn’t really ask for much more – this album packs a punch despite its relatively short running length. The album starts with a brief intro track titled “Harbinger” that sets the tone nicely. There are a total of nine songs and all flow into each other well – I often didn’t realize I was on the next song until I checked. As stated before, the band plays a combination of heavy and speed metal, but at times this album almost has a power metal feel to it. The singer often goes into falsetto that would make King Diamond blush, but at times the singer’s pitch can be a little grating. Going back to King Diamond, the band’s overall style is akin to Mercyful Fate with the up-tempo feel of their songs and the tongue in cheek evil atmosphere they produce. Don’t expect anything too heavy, but the riffs thrown at the listener manage to be powerful and catchy simultaneously. The guitars manage to riff around other instruments well. This is especially evident in the track “A Tyrannous Revolt” where the drums kick off the song followed by guitars that play around the beat in an almost symbiotic way. “Illusions…” has a plethora of similar moments, making every song a joy to listen to. The production is rock solid: each instrument is mixed to appropriate levels and the soundscape isn’t excessively compressed. The album sounds fairly polished, but it fits the style of music being played. Furthermore, the guitar tone is punchy but doesn’t dominate any of the other instruments. At times, the bass shines through particularly well (most notably in the track “A Tyrannous Revolt”), but even when the bass isn’t taking the spotlight it remains audible. All and all, the instruments complement each other well sound-wise. Overall, it’s a damn good record from a band that will hopefully put out more material like this in the future. I don’t have any major issues with “Illusions in Infinite Void” other than its relatively short running time of forty-two minutes and the occasional moments when the vocalist comes off as annoying. However, it’s still one of my favorites of 2015 so far. I strongly recommend this record to fans of 80s heavy and speed metal and people looking for an easily-digestible yet quality metal album.